The hilariously misnamed state "Ethics Commission" has decided that the numerous complaints about Governor McCrory's falsified "ethics disclosures" are perfectly fine by them. But should we be surprised by this outcome, since a majority of this board were appointed by the governor and the Republican leaders in the NC House & Senate? Last year, McCrory did not properly report ownership of stock in Duke Energy, where he worked for 29 years. The governor said he misunderstood a question that wasn't worded clearly. McCrory also did not disclose his position as a board member of the parent company for online mortgage firm LendingTree.com. McCrory resigned from the board during his first month in office, and the Tree.com board voted to let him cash out his shares early. "The governor was paid $185,000 by Tree.com after he was sworn in as governor in 2013," Gerrick Brenner, executive director of Progress NC Action, said during a news conference. "In his first year as governor, McCrory made more money as a board member of Tree.com than he did as governor of this state, and he did not report it on his ethics forms." 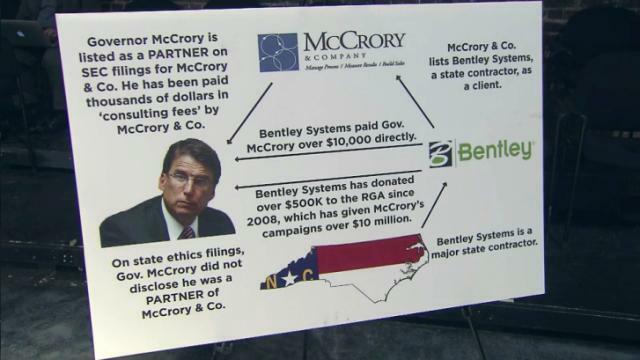 The group is also accusing McCrory of misrepresenting his role as a partner in his brother's firm, McCrory & Co., which does business with the state as well as with major political donors. "I was paid staff for my brother," he said when asked about the ethics complaint during a news conference to announce a deal to sell the Dorothea Dix property to Raleigh for $52 million. He said he hasn't worked for McCrory & Co. since he became governor and declined to answer further questions about the issue. He previously said that any errors he made were honest mistakes. "There are so many troubling omissions that a reasonable person could not simply chalk this up to one innocent simple mistake," Brenner said. "Honest," "simple" mistakes. That our governor is something of a simpleton, he's made perfectly clear numerous times, but "honest"? No. "Honest" as in his most recent howler, saying he didn't hear a major donor he was fawning over pronounce out loud in a meeting with state prison officials that the donor had given plenty of dough and now expected something in return. This was a meeting that McCrory had organized, and convened, and during which he introduced major donor to the others, and for whom his administration engineered a contract about which the FBI is now curious. Tom Sawyer couldn't have organized a whitewashing any faster than our public joke of an "Ethics Commission" did. The ruling simply discredits the Ethics Commission itself, and it prompts the question, "Do the state's ethical disclosure and conflict of interest forms really even matter?" Far from clearing McCrory’s name, the timing of this is highly suspicious. Coming on the heels of multiple federal criminal investigations into pay-to-play allegations involving a DHHS no-bid contract and a private prison contract, this is a blatant attempt to whitewash and mislead the public.